“Nakami” means guts or giblets of pig, and “jiru (shiru)” means soup. 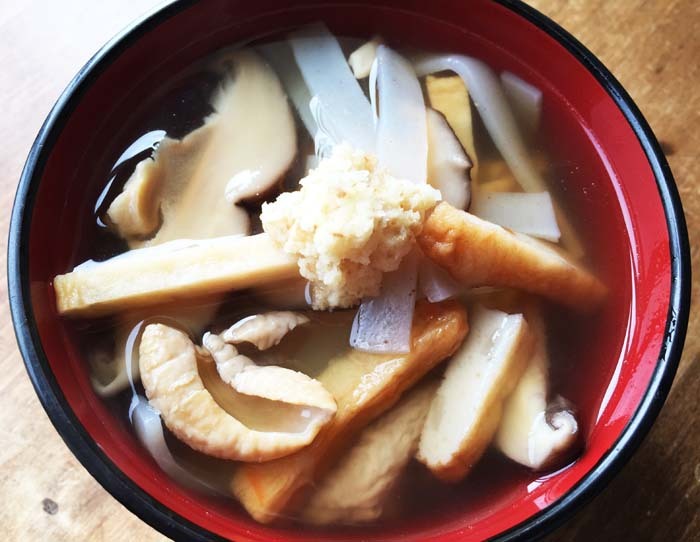 This soup is very common in Okinawa but I wasn’t sure if this soup is something Japan Update readers would be interested in. Then why did I write this recipe? It is because the nakami jiru recipe was requested by one of the readers! I was very surprised to hear someone liked this, but here is the recipe. If you would like to enjoy nakami soba instead of soup, then please add a bit more salt and Okinawa noodles. 1. Put the pork giblets into a bowl and sprinkle wheat flour, just enough to coat them, and ½ teaspoon of sesame oil and salt. Then mix all and massage strongly. Wash off the flour with warm water. 2. Repeat a few times until the water stays clear. 3. In a big saucepan, boil water (not included in the ingredients) and place the pork giblets to boil for about two hours until the pork becomes soft. 4. 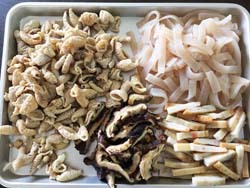 In a bowl, place dried shiitake mushrooms and 1½ cups of water and leave until the mushrooms become soft. (This takes about 1 hour but you can do this process the night before and leave it in a fridge.) Slice the mushrooms and put them aside. 5. Boil 6 cups of water in a saucepan and place the dashi packs in. Bring to a boil and once it boils, turn down to a low-heat and cook for 3 minutes. Then take the dashi packs out. 6. Add boiled pork giblets, kamaboko, mushrooms and konnyaku into the saucepan and bring it to the boil. 7. Turn down to a low-heat and add salt, awamori, soy sauce and mirin. 8. When you serve, place grated ginger on top for garnish. Unique and a cultural experience. A present that lasts forever! Christmas gift certificate is available. You can choose the amount you want from ¥3,000, ¥4,000 and ¥5,000. We can send a gift certificate via email or post to you, or to the person you would like to give it to.